Here's another layout I did for this weeks Creative Scrappers reveal, I created this a few weeks ago in between packing boxes and moving here to Nova Scotia! I wanted to ensure that it was in on time etc, and as soon as I took the photo and emailed it to Kristine I packed it away! Forgotten until today LOL You should really check out the weekly Sunday reveals, great sketches and awesome DT inspiration! And of course, no scrappy session is complete without a dabble into my Sassafras Collection! Here is a sampling of their Marmalade Collection.... I love their products!!! I mixed things up here.....a bit of Jillybean Soup, Sassafras and Prima! WOW!! You NEVER cease to inspire me! Great use of the PP and the MME is BREATH TAKING!! LOVE all of these amazing pages! oh love your layouts.. full of wonderful colors!! i especially like the one for CS.. so full of colors.. amazing!! 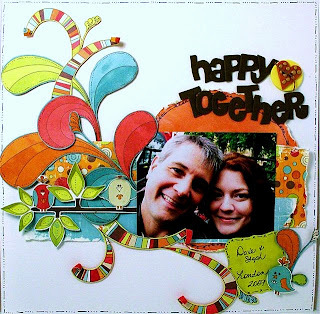 I love that happy together layout, those cut outs just rock! Love it! Amazing layouts, I really love your work! Wow... I just lopve everything you do Steph! I love your layouts..they are so bright and cheery!! !